This fascinating mild-flavoured onion develops bulbs at the top of its slender leaves, not at the base like ordinary onions. Excellent for pickling and for seasoning soups and stews. They keep very well in storage. From one of our customers, here is an excellent tip: "One of the best uses for this onion is to take the bulblet clusters on top of the stems and plant them intact about two inches deep in the fall. 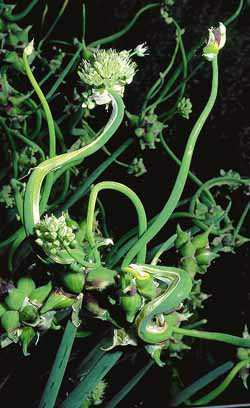 In spring harvest the little bunches of green onions and that will be one of the earliest crops from your garden."